Episode 51 - Solo Instance: GATEKEEPING? IN MY VIDEO GAMES? A podcast that follows the week in gaming news. New releases, eSports, and all kinds of great things happening in gaming are happening here at the Weekly Cooldown! Join host Najee "Kamijace" Walker as he explores the week in gaming with a special guest, every Sunday! Come chill with Kamijace on the Weekly Cooldown! Episode 50 - WAIT, IT'S EPISODE 50?! In this late night episode, Kamijace brings back Moose to discuss FFXIV's new Terms of Service enforcement, something called #BonerCulture and Atlus' decisions on Catherine: Full Body. Plus, Payneful quotes is back! Check it out! You can find Moose on Twitter: @SupremeMoose Website: wkcooldown.com Patreon: Patreon.com/Weeklycooldown Twitter: @Kamijacegaming / @WkCooldown Facebook: https://www.facebook.com/TheWklyCldwn/ HumblePartner Fantasy GameDev bundle: https://www.humblebundle.com/software/fantasy-game-dev-bundle?partner=kamijacegamingSpecial Guest: Moose. Kamijace brings on Samm and a new friend--Kasey, co-creator of Hustle Cat and co-founder of Green Solid! Together, the gang talks about their thoughts on two of the most anticipated games of the year: Kingdom Hearts 3 and Resident Evil 2, and they talk about Metroid Prime 4's delay. Plus, the group plays "Payneful Quotes"! It's a fun episode filled with nostalgia! You can find Samm on Twitter: @Sammneiland You can find Kasey on Twitter: @Spacekase You can find Green Solid on Twitter or on the website: @greensolid or www.http://www.greensolid.net/ or Westfalls.town Website: wkcooldown.com Patreon: Patreon.com/Weeklycooldown Twitter: @Kamijacegaming / @WkCooldown Facebook: https://www.facebook.com/TheWklyCldwn/ HumblePartner Resident Evil 2 Deluxe Edition: https://www.humblebundle.com/store/resident-evil-2-biohazard-re2-deluxe-edition?partner=kamijacegamingSpecial Guest: Samm Neiland. Episode 44 - The Welcome Back Show! Marcy and Corey help Kamijace welcome back all the listeners to a new episode in the new year! The three talk about their faves coming up this month (Resident Evil 2 and Kingdom Hearts are mentioned) as well as more Soulja Boy Console news and a quick talk about H.bomberguy's Mermaid charity stream, with tons of special guests (like the AOC!). PLUS. A new game is played: Payneful Quotes. LEARN MORE and DONATE to Mermaids: https://www.mermaidsuk.org.uk You can find Cory on Twitter @endlessmusings You can find Marcy on Twitter @Shadolith Website: wkcooldown.com Patreon: Patreon.com/Weeklycooldown Twitter: @Kamijacegaming / @WkCooldown Facebook: https://www.facebook.com/TheWklyCldwn/ HumblePartner Resident Evil 2 Deluxe Edition: https://www.humblebundle.com/store/resident-evil-2-biohazard-re2-deluxe-edition?partner=kamijacegamingSpecial Guests: Corey Pangilinan and Marcy Nabors. TheBlevins and Junkelei join Kamijace to talk about all things OWL related! Season 2 is on it's way and the perfect Overwatch fans are here to give the latest updates and thoughts! Plus, TheBlevins digs deep to talk about Artifact and the three go over the latest SouljaBoy Video Game Console! Check it out! You can find Blevins on everything as @TheBlevins! Check out the High Noon Podcast! You can find Junkelei on Twitter and Etsy as @Junkelei! Website: wkcooldown.com Patreon: Patreon.com/Weeklycooldown Twitter: @Kamijacegaming / @WkCooldown Facebook: https://www.facebook.com/TheWklyCldwn/ HumblePartner Hitman 2: https://www.humblebundle.com/store/hitman-2?partner=kamijacegamingSpecial Guest: TheBlevins. Kamijace brings on FFXIV friends Lucerna and Flattus. Lucerna details the goings-on in the Balmung Housing Market, as well as tells us all about her discord server for Balmung housing! Plus, Flattus jumps in to chat about FanFest and speculations about what exciting things Square Enix has behind the curtain! Plus, news from the world of FFXV, hard gaming regulations in China, and Extra Life stories! It's all here! You can find Lucerna on Tumblr: http://darkestaftermidnight.tumblr.com/ Join her Balmung-housing Discord! - https://discord.gg/mRuMsqR You can find Flattus on Twitter: @Flattuss You can find Maelstrom Radio on Twitter or their website! - https://www.maelstromradio.com/ Check out their Extra Life Campaign! - https://www.extra-life.org/index.cfm?fuseaction=donorDrive.team&teamID=39423 Website: Weeklycooldown.fireside.fm Patreon: Patreon.com/Weeklycooldown Twitter: @Kamijacegaming / @WkCooldown Facebook: https://www.facebook.com/TheWklyCldwn/ HumblePartner December 2018 Monthly: https://www.humblebundle.com/monthly?partner=kamijacegamingSpecial Guests: Flattus and Lucerna. Jason Youth joins Kamijace to talk about #BGE2Fairpay, a petition started by Jason dealing with music and artist rights between Ubisoft and HitRecord. Then, later, Jace plays a new game with his guests, Jason, Hay and Marcy. And later they discuss Deltarune and Smash! It's all here! You can find Jason on Twitter @JasonYouth28 - Check out the #BGE2FairPay Petition here: https://www.change.org/p/artists-the-hitrecord-community-bge2fairpay You can find Marcy on Twitter @Shadolith You can find Hay on Twitter @HaybayIsland Website: Weeklycooldown.fireside.fm Patreon: Patreon.com/Weeklycooldown Twitter: @Kamijacegaming / @WkCooldown Facebook: https://www.facebook.com/TheWklyCldwn/ HumblePartner The Bioshock Collection! - https://www.humblebundle.com/store/bioshock-the-collection?partner=kamijacegamingSpecial Guests: Haybay Rhiannon and Marcy Nabors. Episode 37 - The Anniversary Show, Technically. The show has reached one year! Kamijace celebrates by playing some games before the show with Samm, Paul and Marcy! Plus, the three talk about some goings-on in the gaming industry and about their picks for the Golden Joystick Awards coming up next month! There are sooome difficulties throughout the show... but that doesn't stop the Weekly Cooldown! You can find Paul on Twitter @paulsrockintwit You can find Samm on Twitter @SammNeiland You can find Marcy on Twitter @Shadolith Website: Weeklycooldown.fireside.fm Patreon: Patreon.com/Weeklycooldown Twitter: @Kamijacegaming / @WkCooldown Facebook: https://www.facebook.com/TheWklyCldwn/ HumblePartner Discovery Pack: https://www.humblebundle.com/games/discovery-pack?partner=kamijacegamingSpecial Guests: Marcy Nabors, Paul Henderson, and Samm Neiland. The Weekly Cooldown now comes out every Friday! And Kamijace sits down with Samm Neiland and Austin White to test the new format and also talk about PAX West, Riot's decision to make a women and nonbinary inclusive panel at PAX West and Polygon's new review and recommendation system! You can find Austin on Twitter @ARWh1te You can find Samm on Twitter @SammNeiland Website: Weeklycooldown.fireside.fm Patreon: Patreon.com/Weeklycooldown Twitter: @Kamijacegaming / @WkCooldown Facebook: https://www.facebook.com/TheWklyCldwn/ HumblePartner Digital Tabletop Bundle: https://www.humblebundle.com/games/digital-tabletop-bundle?partner=kamijacegamingSpecial Guests: Austin "RougeBludger" White and Samm Neiland. This is both a very serious and light-hearted episode as Kamijace and Twylark talk about the recent shooting in Jacksonville, Florida and discuss how gamers can do better for the community. As well as gun rights and other "political" ideas. We talk both as friends and as concerned gamers. Remember: Any and all media is political. Check out Sunday September 2 episode for links to Facebook, Twitter, and the Humble Bundle. Kamijace brings on Hay and Samm. The three of them talk about some interesting rumors coming out of the FFXIV community about Blue Mage, Streamers defending the use of certain homophobic slurs, and the unfortunate loss of a Star Citizen lawsuit. Plus, the group talks about what games they are looking forward to in 2019! You might already know Kamijace's answer! You can find Hay on Twitter @HaybayRhiannon You can find Samm on Twitter @SammNeiland Website: Weeklycooldown.fireside.fm Patreon: Patreon.com/Weeklycooldown Twitter: @Kamijacegaming / @WkCooldown Facebook: https://www.facebook.com/TheWklyCldwn/ HumblePartner Game Optimization Bundle: https://www.humblebundle.com/software/upyourgame-software?partner=kamijacegaming Intro music by Captive Portal/Zach BriderSpecial Guests: Haybay Rhiannon and Samm Neiland. Kamijace brings back Flattus from Maelstrom Radio! This week, Flattus and Kamijace talk about the latest ArenaNet issues and why firing your worker instead of working on the issues is a bit hasty. Then, they tackle the ongoing Bethesda versus Warner Bros. Lawsuit regarding the Shelter mobile games. And finally, they dig deeper into the mysterious disappearence, and ressurection, of Dead Island 2. Plus, Flattus gives an interesting recommendation for the listeners! It's all here, and it's all fun on the Weekly Cooldown! You can find Flattus on twitter @Flattuss / @Maelstrom_Radio Check out the Maelstrom Radio - FFXIV podcast! - https://www.maelstromradio.com/ You can now find the Weekly Cooldown on Twitter @WkCooldown ! Website: Weeklycooldown.fireside.fm Patreon: Patreon.com/Weeklycooldown Twitter: @Kamijacegaming / @WkCooldown Facebook: https://www.facebook.com/TheWklyCldwn/ HumblePartner Hollow Knight sale: https://www.humblebundle.com/store/hollow-knight?partner=kamijacegaming Intro music by Captive Portal/Zach BriderSpecial Guest: Flattus. 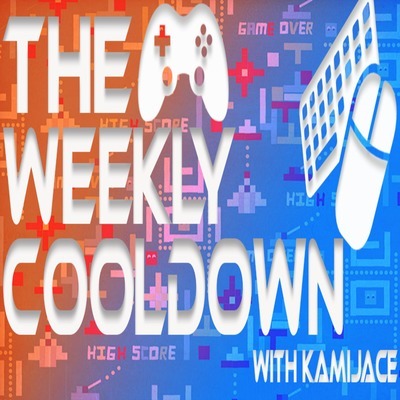 Kamijace and Paul go one-on-one and discuss some fairly heavy topics this week on the Weekly Cooldown. They talk about Sony's no-crossplay, and the Microsoft/Nintendo response to that. Plus, Gaming Addicitons, and the upcoming SGDQ. Plus, Kamijace gives Paul a very special proposition toward the end of the episode... You won't want to miss it! Find Paul on twitter @paulsrockintwit and on Twitch Streams on Tuesdays! Check out Paul's time at SGDQ here: https://www.youtube.com/watch?v=0ORXOzjxHNQ Website: wkcooldown.com Twitter: @Kamijacegaming / @WkCooldown Humble Partner (KONAMI Bundle): https://www.humblebundle.com/store/promo/konami-digital-entertainment-sale?partner=kamijacegaming Patreon: Patreon.com/Weeklycooldown Facebook: https://www.facebook.com/TheWklyCldwn/ Intro music by Captive Portal/Zach Brider Music by audionautix.comSpecial Guest: Paul Henderson. Episode 25 - The Big Bad E3 Special Show! Kamijace brings on Samm and Marcy to yell about their favorite things about E3 and quickly recap the announcements! I wouldn't listen to this one on high volume. It's a great show in which Samm yells about Mechs, Marcy talks about Xenogears and Kamijace yells about the Resident Evil 2 remake. Basically, everyone is really predictable, but in a good, fun way! Check it out! You can find Marcy on Twitter @Shadolith You can find Samm on Twitter @SammNeiland Website: Wkcooldown.com Patreon: Patreon.com/Weeklycooldown Twitter: @Kamijacegaming / @WkCooldown Facebook: https://www.facebook.com/TheWklyCldwn/ Intro music by Captive Portal/Zach BriderSpecial Guests: Marcy Nabors and Samm Neiland. Kamijace brings on Marcy and Samm in this episode, to test out the new format. Kamijace delivers the big headlines of the week and then, after headlines, Samm launches into his thoughts on Detroit: Become Human. Marcy talks about Monster Hunter (and a little bit of Pokemon news), and Kamijace talks all about the latest layoffs and shutdowns at popular video game companies. It's a pretty fun episode, so check it out! You can find Marcy on Twitter @Shadolith You can find Samm on Twitter @SammNeiland Website: Wkcooldown.com Patreon: Patreon.com/Weeklycooldown Twitter: @Kamijacegaming / @WkCooldown Facebook: https://www.facebook.com/TheWklyCldwn/ Intro music by Captive Portal/Zach BriderSpecial Guests: Marcy Nabors and Samm Neiland. Kamijace brings on Samm and Nii to talk about the latest news in gaming! Nii, talks about the latest collaboration from Microsoft and Blizzard: Flash Ops! Then, the gang briefly talks about Dreamkazper's sexual misconduct allegations with a minor. Plus, the group geeks out about the new Radical Heights and You Don't Know Jack Games. Also, the King of Kong loses his title after being accused of cheating. Plus, some great recommendations from the two guests! You can find Samm on Twitter @SammNeiland You can find Nii on twitter @Niiishake Flash Ops information: https://playoverwatch.com/en-us/blog/21671840 Website: wkcooldown.com Patreon: Patreon.com/Weeklycooldown Twitter: @Kamijacegaming / @WkCooldown Facebook: https://www.facebook.com/TheWklyCldwn/ Intro music by Captive Portal/Zach Brider Music by audionautix.comSpecial Guests: Nii and Samm Neiland. Episode 20 - The "Weekly" VODcast! LIVE! Join Kamijace, Austin White and Paul Henderson for the first Weekly Cooldown LIVE show hosted on Twitch! Check it out here, or check out the whole video on youtube: https://www.youtube.com/watch?v=ghedsrE6jb4&t The gang talks about streamers--in general, Geguri, NYXL's Stage 2 performance, Sea of Thieves, and tons more! You can find Austin on twitter @arwh1te You can find Paul on twitter @Paulsrockintwit Website: Wkcooldown.com Patreon: Patreon.com/Weeklycooldown Twitter: @Kamijacegaming / @wkcooldown Facebook: https://www.facebook.com/TheWklyCldwn/Special Guests: Austin "RougeBludger" White and Paul Henderson. Kamijace sits one-on-one with Jared Chesnut to chat about some sonic racing rumors, Call of Duty: Modern Warfare 2, and a bunch of news coming out of the Game Developers Conference, specifically, game worker's rights, the right to a union, and also how game companies are tackling toxicity. Plus, Jared gives a really great recommendation for a new game you should be playing! Check it out! Find Jared on Twitch at twitch.tv/vectorspecter Website: Wkcooldown.com Patreon: Patreon.com/Weeklycooldown Twitter: @Kamijacegaming / @wkcooldown Facebook: https://www.facebook.com/TheWklyCldwn/Special Guest: Jared "VectorSpector" Chesnut. Kamijace brings on a new guest, Sahb, and Kyuu to talk about FFXIV's 4.25 update, the new Eureka zone, and some other Square Enix news. Plus, Tomb Raider. Sahb also gives Kamijace more recommendations than he knows what to do with! And the group talks about Sombra's incoming nerfs and the state of the Overwatch League. You can find Sahb on Twitter @hashverda You can find Kyuu on Twitter @OmegaKyuu Website: wkcooldown.com Patreon: Patreon.com/Weeklycooldown Twitter: @Kamijacegaming / @WkCooldown Facebook: https://www.facebook.com/TheWklyCldwn/ Discord: https://discord.gg/z7kxHyN Intro music by Captive Portal/Zach Brider Music by audionautix.comSpecial Guest: Kyuu. Kamijace, Samm Neiland and Paul Henderson all come together after some technical issues with Samm's mic, to talk about the non-exitent correlation between violent games and violent people, the great Nintendo Direct news, Crash Bandicoot, some announcements from Ubisoft and Treyarch, and the current state for the OWL (yes, including some thoughts on Mr.xQc). Also! Some great recommendations from both guests! Check it out! You can find Samm on Twitter @SammNeiland You can find Paul on Twitter @Paulsrockintwit Website: wkcooldown.com Patreon: Patreon.com/Weeklycooldown Twitter: @Kamijacegaming / @WkCooldown Facebook: https://www.facebook.com/TheWklyCldwn/ Intro music by Captive Portal/Zach Brider Music by audionautix.comSpecial Guests: Paul Henderson and Samm Neiland. Kamijace invites some brand new guests, Nii and Flattus, to talk about the "crisis" that is FFXIV housing, Geguri's introduction to the Overwatch League (possibly) and the Metal Gear Survive Beta. Listen to what Nii would do just to see Geguri play Overwatch live! Plus, Nii and Flattus give us their gaming recommendations! You can find Nii on twitter @Niiishake You can find Flattus on twitter @Flattuss / @Maelstrom_Radio You can now find the Weekly Cooldown on Twitter @WkCooldown ! Website: Weeklycooldown.fireside.fm Patreon: Patreon.com/Weeklycooldown Twitter: @Kamijacegaming / @WkCooldown Facebook: https://www.facebook.com/TheWklyCldwn/ Intro music by Captive Portal/Zach Brider Music by audionautix.comSpecial Guests: Flattus and Nii. Episode 14 - More Overwatch, More Nintendo, More...Harassment? Kamijace brings on two favorites, Paul Henderson and Austin White, to talk about the Overwatch League. Paul goes on a rant about why Mercy is dead (RIP Mercy). The gang also talks about some interesting Nintendo moves, and Mario Kart Tour. Plus, the guys talk once again, about more sexual harassment in the gaming-workplace, from one of gaming's most prominent figures. You can find Paul on twitter @Paulsrockintwit You can find Austin on Twitter @ARWh1te You can now find the Weekly Cooldown on Twitter @WkCooldown ! Website: Weeklycooldown.fireside.fm Patreon: Patreon.com/Weeklycooldown Twitter: @Kamijacegaming / @WkCooldown Facebook: https://www.facebook.com/TheWklyCldwn/ Intro music by Captive Portal/Zach Brider Music by audionautix.comSpecial Guests: Austin "RougeBludger" White and Paul Henderson. Kamijace brings on two fighting game nerds, Moose and, new to the podcast: "Sylvan Rain", to talk about the latest in fighting game news, and give some in-depth thoughts about Dragonball Fighter Z. Plus, the group talks about the latest developer update from Jeff Kaplan and the state of Overwatch so far. You can find Sylv on tumblr at: http://sylvan-rain.tumblr.com/ You can find Moose on Twitter @MooseFGC You can now find the Weekly Cooldown on Twitter @WkCooldown ! Website: Weeklycooldown.fireside.fm Patreon: Patreon.com/Weeklycooldown Twitter: @Kamijacegaming / @WkCooldown Facebook: https://www.facebook.com/TheWklyCldwn/ Intro music by Captive Portal/Zach Brider Music by audionautix.comSpecial Guests: Moose and Sylv. Kamijace sits down with TheBlevins from the High Noon Podcast. Blevins and Kamijace chat everything Overwatch League (so far) and talk about the latest in Dallas Fuel controversy. Plus, what would Blevins do with a Nintendo Labo? And, Kyuu and Lahn enter the podcast to talk about FFXIV Patch 4.2, Sigmascape, Kefka's appearance, and so much more! Check out this episode! You can find TheBlevins on Twitter @The_Blevins You can find the High Noon Podcast at Highnoonpodcast.com and on twitter @HighNoonPodcast You can find Kyuu on Twitter @OmegaKyuu You can find Lahn on Twitch as Laoni You can now find the Weekly Cooldown on Twitter @WkCooldown ! Website: Wkcooldown.com Patreon: Patreon.com/Weeklycooldown Twitter: @Kamijacegaming / @WkCooldown Facebook: https://www.facebook.com/TheWklyCldwn/ Intro music by Captive Portal/Zach Brider Music by audionautix.comSpecial Guests: Kyuu, Lahn, and TheBlevins. Kamijace brings on three very special friends. "The Hangout Crew", Kyuu, Moose and--very last minute, but nonetheless welcome--Hay, join Kamijace to talk about AGDQ, Nintendo Direct Mini's latest reveals, and Yume Nikki. Plus, the group talks about which games they'd like to see brought from the past and into the year 2018. Also, will Nintendo ever give Kamijace his DK64 successor? (Who knows). Listen to this awesome episode with great guests! You can find Moose on Twitter @MooseFGC You can find Kyuu on Twitter @OmegaKyuu You can find Hay on Twitter @HaybayRhiannon You can now find the Weekly Cooldown on Twitter @WkCooldown ! Website: Wkcooldown.com Patreon: Patreon.com/Weeklycooldown Twitter: @Kamijacegaming / @WkCooldown Facebook: https://www.facebook.com/TheWklyCldwn/ Intro music by Captive Portal/Zach Brider Music by audionautix.comSpecial Guests: Haybay Rhiannon, Kyuu, and Moose. Kamijace is joined by Marcy Nabors, Samm Neiland and Corey P. to talk about all things MAGFest! Where games and music come together in a big way. As always, they speak about what games they have been playing this week which includes Wheel of Fortune for the Sega Genesis. There's a lot of great stuff in this episode, so check it out! You can find Marcy on Twitter @Shadolith You can find Samm on Twitter @SammNeiland You can find Corbin on Twitter @Endlessmusings You can now find the Weekly Cooldown on Twitter @WkCooldown ! Website: Wkcooldown.com Patreon: Patreon.com/Weeklycooldown Twitter: @Kamijacegaming / @WkCooldown Facebook: https://www.facebook.com/TheWklyCldwn/ Intro music by Captive Portal/Zach Brider Music by audionautix.comSpecial Guests: Corey Pangilinan, Marcy Nabors, and Samm Neiland. For a very special New Year's Eve episode, Kamijace brings back some Guests of the Year--Hay, Marcy and Paul--to talk about 2017's best games, best game music, and the games they're looking forward to in 2018. Plus, Hay and Paul start planning for their duet cover of Persona 5 songs(maybe?)! It's a really fun, really great episode to bring in the New Year, thank you for joining us! See you in 2018! You can find Hay on Twitter @Haybayrhiannon You can find Paul on Twitter @Paulsrockintwit You can find Marcy on Twitter @Shadolith Check out Marcy getting scared of the Guardian here: https://twitter.com/Shadolith/status/947250114103361537 Check out Paul's meme-ing here: https://twitter.com/PaulsRockinTwit/status/945143650027110401 You can now find the Weekly Cooldown on Twitter @WkCooldown ! Website: Wkcooldown.com Patreon: Patreon.com/Weeklycooldown Twitter: @Kamijacegaming / @WkCooldown Facebook: https://www.facebook.com/TheWklyCldwn/ Intro music by Captive Portal/Zach Brider Music by audionautix.comSpecial Guests: Haybay Rhiannon, Marcy Nabors, and Paul Henderson. Kamijace welcomes Lucerna to the Weekly Cooldown. Though this is a shorter Cooldown than usual, Lucerna and Kamijace still touch on some interesting topics in the world of gaming, even as gamers slowly prepare for the new year. Game demos make up the bulk of the news lately, as we prepare for a bunch of exciting new releases in 2018 (Lucerna is hoping for Kingdom Hearts 3!). Also, FFXIV had a particularly interesting Live Letter this week! And of course, we do need to have a tiny discussion about our favorite government branch: the FCC. Take a listen! Find Lucerna on Tumblr: http://darkestaftermidnight.tumblr.com/ -- Website: Wkcooldown.com Patreon: Patreon.com/Weeklycooldown Twitter: @Kamijacegaming Facebook: https://www.facebook.com/TheWklyCldwn/ Intro music by Captive Portal/Zach Brider Music by audionautix.comSpecial Guest: Lucerna. This week, Kamijace Welcomes back Austin White ( @ARWh1te). Austin writes for EGF and now for the Overwatch Score as their London Spitfire write. Kamijace and Austin get into a bit of Overwatch League analysis, and talk about the Game Awards. Plus, it wouldn't be a conversation about video games without some talk about loot boxes. Also, we still need your help for the big year end show! Tweet @Kamijacegaming or just use the #WKCD2018 and tell us about your favorite game, or your favorite moment in gaming news! Check out Austin's work on EGF and the Overwatch Score below. Also, follow him on twitter and Instagram: https://twitter.com/arwh1te https://www.instagram.com/ArWh1te/ http://media.egfederation.com/tags/arwh1te https://www.overwatchscore.com/author/austin_white/ -- Website: Wkcooldown.com Patreon: Patreon.com/Weeklycooldown Twitter: @Kamijacegaming Facebook: https://www.facebook.com/TheWklyCldwn/ Intro music by Captive Portal/Zach Brider Music by audionautix.comSpecial Guest: Austin "RougeBludger" White. Kamijace sits down with Marcy Nabors ( @Shadolith) and Paul Henderson ( @PaulsRockinTwit) to talk about the gaming news this week. From Xenoblade, to Overwatch, to Super Mario Cereal. We talk about Tencent's plans to overtake the Battle Royal genre, as well. Plus, Paul coins the term "Coolheads". We mention all the new releases coming out this month, you can check the rest of those out in the link below. (Thanks Gamespot!) https://www.gamespot.com/articles/game-release-dates-in-december-2017-for-ps4-xbox-o/1100-6455214/ Follow Marcy on Twitter: https://twitter.com/Shadolith Follow Paul on Twitter: https://twitter.com/PaulsRockinTwit Website: Wkcooldown.com Patreon: Patreon.com/Weeklycooldown Twitter: @Kamijacegaming Facebook: https://www.facebook.com/TheWklyCldwn/ Intro music by Captive Portal/Zach Brider Music by audionautix.comSpecial Guests: Marcy Nabors and Paul Henderson. This week, Frank Cifaldi ( @frankcifaldi) joins Kamijace to talk about The Video Game History Foundation, and all the good that they're trying to do for gamers! Plus, Hay "Haybay" ( @haybayrhiannon) and "Lahn/Laoni" (https://www.twitch.tv/laoni) join me as we tackle all the week's news! From FFXIV, to Battlefront 2, to Fighting EX Layer, to more sexual assault allegations at IGN, and everything in between. Remember to subscribe, comment, and give us a rating on iTunes and now on Stitcher! It helps us grow! Also, like the Facebook page, catch the Weekly Cooldown on Patreon, and follow me on Twitter @Kamijacegaming Website: Wkcooldown.com Patreon: Patreon.com/Weeklycooldown Twitter: @Kamijacegaming Facebook: https://www.facebook.com/TheWklyCldwn/ Intro music by Captive Portal/Zach Brider Music by audionautix.comSpecial Guests: Frank Cifaldi, Haybay Rhiannon, and Lahn. Another great episode coming at you! This time, I sit down with Jared "VectorSpecter" Chesnut ( @chesnutroasting), and we go over some news from Tekken 7, to Injustice 2. Plus, we, unfortunately, talk about more sexual harassment in the video game-workplace. Also! We chat about Sonic and other 20+ year old series we wish were around, and so much more packed into this episode, and you won't want to miss it! Remember to subscribe, comment, and give us a rating on iTunes and now on Stitcher! It helps us grow! Also, like the Facebook page, catch me on Patreon, and follow me on Twitter @Kamijacegaming Find Jared on Twitch at twitch.tv/vectorspecter Website: Wkcooldown.com Patreon: Patreon.com/Weeklycooldown Twitter: @Kamijacegaming Facebook: https://www.facebook.com/TheWklyCldwn/ Intro music by Captive Portal/Zach Brider Music by Frank NoraSpecial Guest: Jared "VectorSpector" Chesnut. In this week's episode, I am joined by Austin White ( @ARWh1te on twitter). We discuss the League of Legends champions, the upcoming Overwatch League, Blizzcon, the Golden Joystick Awards, and so much more! Austin also writes for EGF, so be sure to check them out! Also, thank you and congrats to everyone who participated in the Extra Life's Game Day campaign this weekend! Remember to subscribe, comment, and give us a rating on iTunes! It helps us grow! Also, when you share this, our Facebook page, or tag @Kamijacegaming on Twitter, you'll be entered into a drawing to win an Amazon or Steam Gift Card! Awesome, right? Then get to it! Check out the EGF news and media at media.egfederation.com Website: Wkcooldown.com Patreon: Patreon.com/Weeklycooldown Twitter: @Kamijacegaming Facebook: https://www.facebook.com/TheWklyCldwn/ Intro music by Captive Portal/Zach Brider Music by Frank NoraSpecial Guest: Austin "RougeBludger" White. Episode 2: eSports, Blue Zones, Definitely. In this week's episode, I sit down with David "Hauntze" Chen ( @Hauntze) of Electronic Gaming Federation and we talk about everything from the Kinect to eSports to Extra Life. Also...more sexual harassment? Hauntze and Kamijace re-hash the NeoGAF situation. Remember to subscribe, comment, and give us a rating on iTunes! It helps us grow! Also, when you share this, our facebook page, or tag @Kamijacegaming on Twitter, you'll be entered into a drawing to win an Amazon or Steam Gift Card! Awesome, right? Then get to it! Check out the EGF news and media at media.egfederation.com http://najeew93.wixsite.com/the-weekly-cooldown (Wkcooldown.com coming soon!) Patreon: Patreon.com/Weeklycooldown Twitter: @Kamijacegaming Facebook: https://www.facebook.com/TheWklyCldwn/ Intro music by Captive Portal/Zach Brider Music by Frank NoraSpecial Guest: David "Hauntze" Chen. Kamijace sits down with Samm Neiland ( @SammNeiland) to talk about loot boxes, Cuphead's rise to success, and even, sexual harassment in the gaming community. Plus a whole lot of other news topics. The Weekly Cooldown is starting a giveaway! Help make us better and gain more listeners by sharing on social media, or by rating us on iTunes! Sharing and rating and comments all count as an entry toward an Amazon Gift Card! Let the Weekly Cooldown help you to buy that next great game you're looking forward to! Gaming news never stops when this podcast ends, so, follow Kamijace on twitter for more ( @Kamijacegaming) and don't forget to check out the Patreon page ( https://www.patreon.com/Weeklycooldown ) Website: http://najeew93.wixsite.com/the-weekly-cooldown Facebook: https://www.facebook.com/TheWklyCldwn/ Intro music by Captive Portal/Zach Brider Music by Frank NoraSpecial Guest: Samm Neiland. A new gaming news Podcast is headed your way! Join Najee "Kamijace" Walker as he explores the week in gaming news with you, and a special guest. From eSports to New Releases, you can find it all and more, here with Kamijace! Episodes release every Sunday to recap the previous week's news and any special updates that may come out. With special episodes likely. Plus! Giveaways and free stuff! Come and chill with Kamijace on the Weekly Cooldown!